History of “Ukrprompostach-95” began in 1995. There was a team of like-minded people at the head of the newly established company who were united by a common purpose – to make really tasty and quality meat and sausage products, as they have been Ukrainian favorite dishes for ages. Closed production cycle. We carefully monitor every stage: from cattle slaughter to sale of finished products. Complete industrial complex, where all the shops and structural departments are located in the same area. We constantly invest in modern high-tech equipment according to European standards. The use of the best raw materials guarantees consistent product quality. Certified measurement laboratory, which controls the processes of manufacturing products by a sampling method for laboratory testing. We do not use the admixture, artificial flavor enhancers, sausage ripening accelerators and products from GMOs. There is a wide range of all kinds of sausages, a variety of deli meats and natural semi-finished products. There are original recipes based on traditional Ukrainian dishes such as ham, baked meat, rolls, homemade sausages. Special pride – a line of elite jerked sausages containing Italian wines and spices. Due to the special manufacturing technology uncooked jerked sausages have a longer shelf life and a unique and special flavor. Quality Control System of State Standard of Ukraine ISO 9001: 2009 and safety management system of food State Standard of Ukraine ISO 22000: 2007 (established on the basis of the HACCP quality system – Hazard Analysis and Critical Control Point) have been implemented on the enterprise. We strive to make our products meet the highest international standards. Our own network of company stores in Kiev and the regions where you can buy exclusive products, not available in other places. 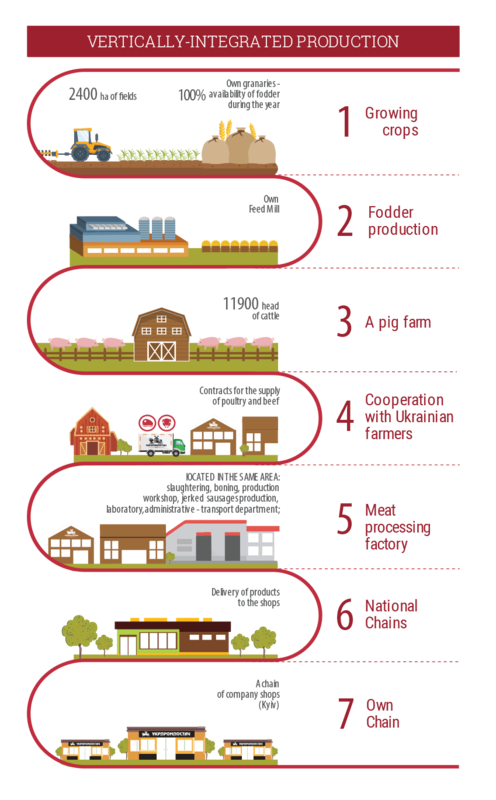 At the heart of our business – the desire to make natural sausage products to the highest quality standards. While tasting them people could feel: «It is delicious like in childhood». Focusing on consumers, responsible partnership, innovation as a means of continuous improvement of production processes and finished products. More than 400 employees daily care about strict quality control at all stages of production and improving the enforcement of manufacturing technology , due to this you can taste the best meat and sausage products. Most of the team of «Ukrprompostach-95» brings together not only the professionalism and responsible attitude to business problems but also love for their work and a desire to change the culture of consumption in Ukraine for the better.